Prices being paid for high-quality Illinois farmland, as well as cash rents stayed essentially flat in 2017, according to the Illinois Society of Professional Farm Managers and Rural Appraisers (ISPFMRA). The organization’s findings are based on an annual survey. “The news is there isn’t much new regarding land values or changes in rents being paid for farmland,” says David Klein, AFM, ALC, with Soy Capital Ag Services and chair of the annual project. “Prices paid for excellent-quality farmland across the northern part of the state were down 1% to 2% with ranges from $10,500 to $11,000 per acre. That same quality of land in the central part of the state went for $10,350 to $11,400 per acre in 2017, which was flat-to-down 5%. “In the southern regions of the state there was really no movement at all in terms of drops or increases in prices for land. It was going from $8,000 to $10,885 per acre in the same areas as it was a year ago,” he states. The statewide average prices being paid for excellent-quality farmland have dropped from their peak of $12,500 per acre in 2013. “Comparatively, though, the average price paid for this same farmland in 2002, 15 years ago, was a little over $3,400 per acre,” Klein notes. Looking ahead, 20% of survey respondents expect farmland values will remain unchanged in 2018 versus 2017. Only 4% look for values to rise 1% to 5%; 54% expect values will decrease 1% to 5% and 22% anticipate a decline of 5% to 10%. 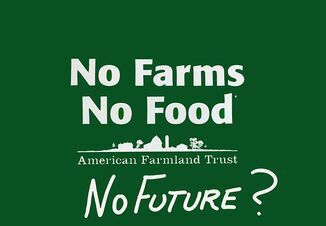 The primary trigger that could cause farmland prices to significantly drop (more than 5%) is falling commodity prices because of good growing conditions in the U.S., according to survey respondents. An increase in interest rates could also impact demand, and cause prices to drop. The profile of the buyers of farmland remains consistent, with farmers accounting for 62% of that group. “They know the value as well as, if not better than, anyone else and they are reinvesting into their own farm businesses,” Klein says. Investors, local and otherwise, are the second largest group of buyers accounting for 23% of sales. “Estate sales still lead the way as the greatest reason for a property to come on the market,” he explains. Private treaty is still the most popular way of selling land, 49%, followed by public auction, 35%. 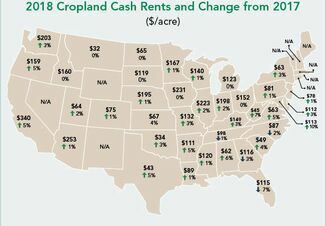 Similar to the farmland price trends, cash rent prices for excellent-quality farmland are stable. Rent prices ranged from $295 to $325 per acre in the northern part of the state, $300 to $350 per acre for the central region and $160 to $325 in the southern counties. For excellent-quality farmland, traditional crop shares had an average landlord income of $193 per acre, cash rent had $230 per acre and custom farming had $253 per acre, says Gary Schnitkey, ag economist at the University of Illinois. Across all productivities, a straight crop share lease had the lowest returns, while cash rent and custom farming had similar returns for the good-, average- and fair-quality land classes. There is a great deal of variability in cash rents for a given land productivity, Schnitkey notes. For example, the average cash rent for the mid-third group on excellent-quality farmland is $298 per acre. The high third of leases averaged $317 per acre, $19 higher than the mid-third group. Similarly, the low third group averaged $258 per acre, $40 lower than the mid-third group. The stable rental market Illinois saw last year is likely to continue. “Fifty-eight percent of respondents expected 2019 cash rents to remain the same as 2018 cash rents,” Schnitkey explains. The respondents to the Illinois Society of Professional Farm Managers and Rural Appraisers’ annual survey provide a little color and background to the trends shaping the various land classes in Illinois. Excellent: Values pulled back, but remained relatively strong in areas. Pockets of strength in prices still exist. Buyers remain willing to pay for high-quality soil. Good: Farmers were primary buyers of this land class. Buyers were cautious and looking for deals. Recreational: Volume of sales for recreational land increased slightly. There was more support around metropolitan areas, while the recreational land in very rural areas saw longer marketing periods. Prices are tied more to the general economy. 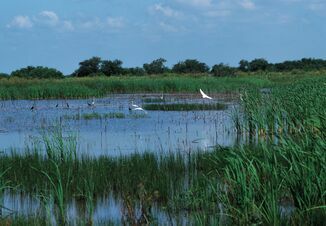 More land news is included in every issue of LandOwner Newsletter. Try it free here.